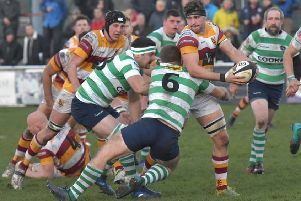 Head coach Warren Spragg admits some of his Fylde RFC players will be unlucky to find themselves in the second XV this weekend as he grapples with selection problems for Saturday's massive match away to high-flying Chester. Fylde would make a massive statement of intent by gaining a third successive National Two North win away to second-placed Chester and Spragg has virtually a full-strength squad to choose from. Centre Ralph Dowds is nursing an injury but every other senior squad member is available as Fylde bid for their biggest scalp of the season to date. And that means some unenviable selection decisions for Spragg, particularly among the forwards. The head coach told The Gazette: “These are the sort of headaches you want but there are some really tough choices to be made. “All the front-rowers are playing well, so there will be some lads playing for the seconds this weekend who will feel hard done by. Those in possession of the shirts staked a strong claim to keep them as Fylde followed victory at Stourbridge with last weekend’s 42-20 home win over South Leicester which lifted the Woodlands club to sixth. It wasn’t the perfect performance as South Leicester got on top after half-time to fight back from 35-8 down. But with some attractive tries shared between six different scorers, the positives heavily outweighed the negatives for Spragg. He added: “We played good rugby in parts but then had 20 minutes when we dropped off in the second half. “But I think it’s pleasing when the team can score 40 points and still be frustrated by the overall performance. It shows the standards we are setting. “I’m pleased with the six tries because we really want to play the brand of rugby Fylde are renowned for. “The outside backs are getting on the scoresheet regularly and are in a good place. “Tom Carleton and Tom Grimes are on track for decent returns and only two sides have more try bonus points than us . Another player on the scoresheet with the young Sale half-back Gus Warr, who registered his first Fylde touchdown within moments of coming on as a replacement. Fylde have outscored tomorrow’s hosts Chester, who boast one of the division’s best defensive records and Spragg knows they will present a massive challenge. “They are not so high in the table without being a very good side,” he said. “They are consistent and well-drilled, with dangerous backs who have real pace. “They don’t score a massive amount (Chester edged out Wharfedale by three points last Saturday) but they have won nine out of 11 and it will be a really good test for us.